This poor hedgehog was found with a plastic cable tie trapped around her waist. The tie has cut deep into the flesh on her belly. The cable tie goes all around the body of the hedgehog. This hedgehog comes from an area of York that is monitored by a night camera and she is very lucky to have been spotted. The cable tie was wrapped around her entire body. Initially I thought this might be accidental because hedgehogs can often get trapped in plastic rubbish but the position of the plastic (between both sets of legs and all around the body) means would have been quite hard for the hedgehog to get caught in it. There is also no damage to the spines on her back which I would have expected if the hedgehog had got stuck in it when she was younger and had then grown. She is probably a year or two old. I may be wrong (and we will never know for sure) but I now suspect that this is a deliberate act of animal cruelty. This hedgehog comes from an area where there have been several hedgehogs recently with alarming injuries including several open fractured legs. I wonder if these might have been trap injuries. I may be jumping to the wrong conclusion but I find it hard to believe that a hedgehog has got itself caught in this particular piece of plastic. The vet who treated this hedgehog also suspected a deliberate act of cruelty. The wound has now been stitched and pain relief given. Luckily the wound is not infected. It looks like she will make a good recovery. Due to the chance that this could be a deliberate injury, she will be kept over Winter and then relocated in the Spring. This in itself is very sad because hedgehogs can be disadvantaged by relocation because they do not know where to find food and shelter in the new area but I think it is for the best in this case. You can read more about the dangers of plastic rubbish for wildlife here and also more about me and my work. 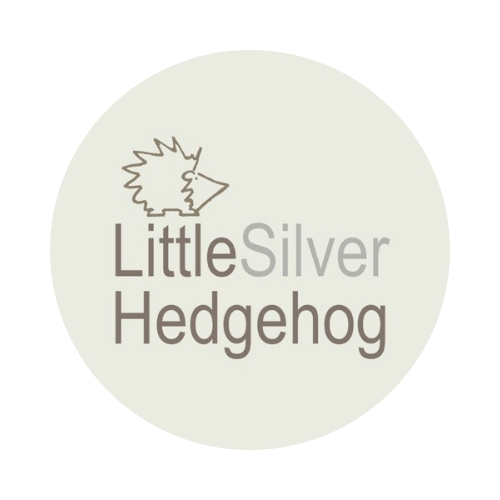 My work is entirely self-funded and if you have found this information useful, please consider supporting my work or checking out my handmade silver nature jewellery. Lucky to have been spotted and cared for, poor little thing. It is hard to think of anything other than a shockingly cruel deliberate act. Lucky that the hedgehog was rescued, and I hope that the eventual relocation works out for her. Thanks for all that you do. Just heartbreaking. Don’t want to appear to cynical of humankind but I feel like I’ve heard of enough cases of animal cruelty to be convinced by your theory. Good to have the relief that the hedgehog was relatively lucky though.